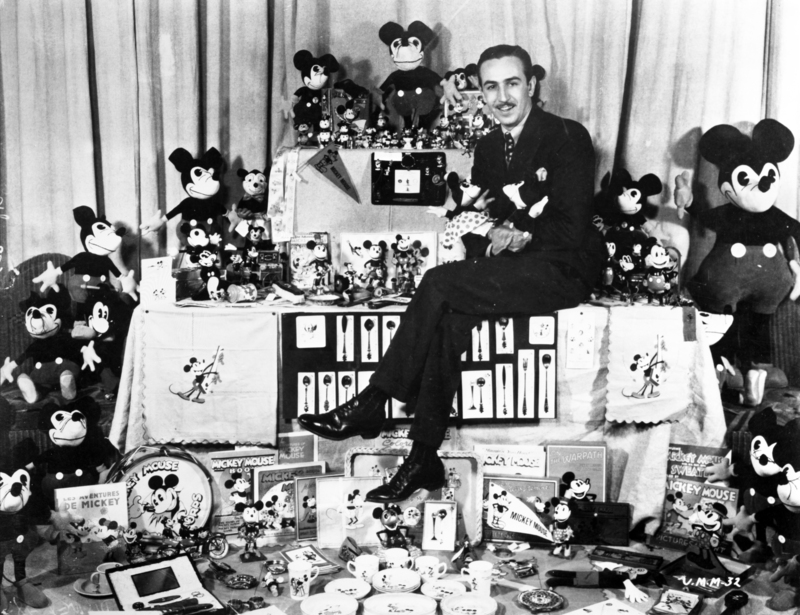 Walt Disney shares a moment with Mickey and Minnie, circa October 1933. Photo © Condé Nast Archive/Corbis. Walt Disney always reminded me of my childhood pediatrician. And that was a very good thing. Not only did they look alike, but both men were, in fact, passionate healers who never lost their ability to speak to the needs of children… and “the child” within the older folks who raised them. One man greeted me every Sunday night from my TV screen; the other stopped by regularly to cure what ailed me. To me, my parents and the rest of his patients, my doctor was a saint. In a larger playing field, Walt Disney was a creative genius whose body of work made us all feel really good. My doctor effortlessly removed my tonsils in his office and alleviated my measles’ scare. Walt Disney gave me Snow White, Pinocchio, Cinderella, Bambi, Davy Crockett, Mary Poppins, Hayley Mills and The Mickey Mouse Club. I had a charmed, healthy childhood thanks to those two men. The first two hours of Walt Disney cover Disney’s critically formative early years (1901-1941). Seemingly driven to rewrite the story of his unhappy Midwestern childhood–his domineering dad’s string of business failures continually uprooted the family–Disney channeled his psychological wounds and considerable artistic talent into a career in the nascent movie industry. As is the case with most visionaries, timing is everything; and for Walt Disney, the time was right for his all-consuming passion: Animation. Walt, Mickey and the merch, circa 1931. Photo © Disney. Animation was a growth industry, a genre primed for the enormous innovative, entrepreneurial skills that Disney brought to the table. 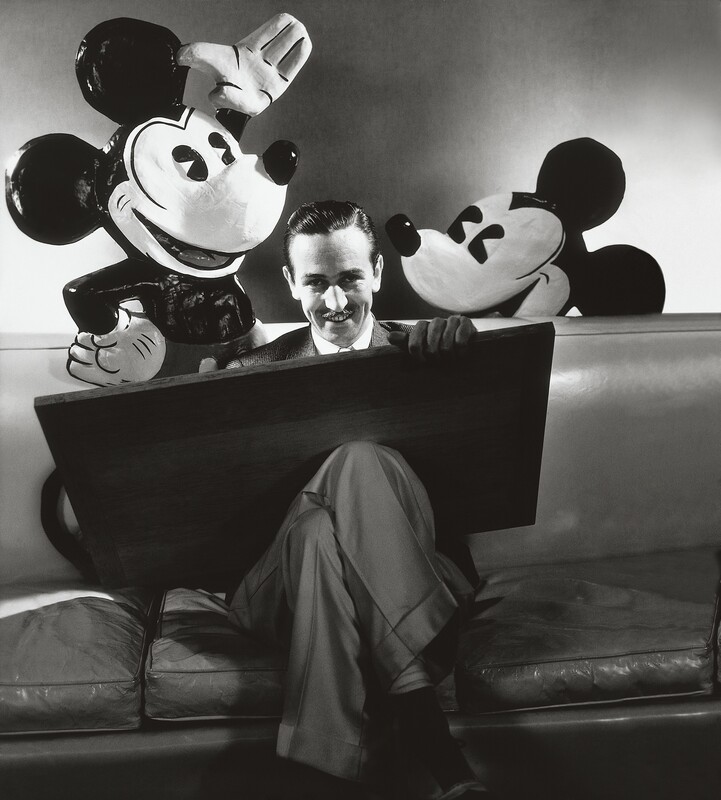 With his brother Roy as his financial advisor and a team of dedicated, talented artists by his side, Disney planted and grew a lucrative niche in Hollywood. By 1928, the Disney Brothers Studio premiered Steamboat Willie, and a star named Mickey (Walt’s “alter ego”) was born. Part One of Walt Disney draws an absorbing portrait of a man who had an instinctive understanding of his audience and a knack for building a brand, decades before “branding” became a buzzword. The film provides a fascinating look at his tenacious efforts to film and release Snow White and the Seven Dwarfs (1937) as the first ever feature-length, story-driven animation. Despite his naysayers and obsessive attention to detail that slowed production to a crawl, Snow White was an immediate critical and box office hit that grossed $8 million during its first year (that’s more than $100 million today!). Clips from Snow White and other classics produced during this period, including the initially less successful Pinocchio (1940) and Fantasia (1940) are plentiful, as are vintage behind-the-scenes film clips, home movies and on-camera analyses by various film scholars, critics and cultural pundits. 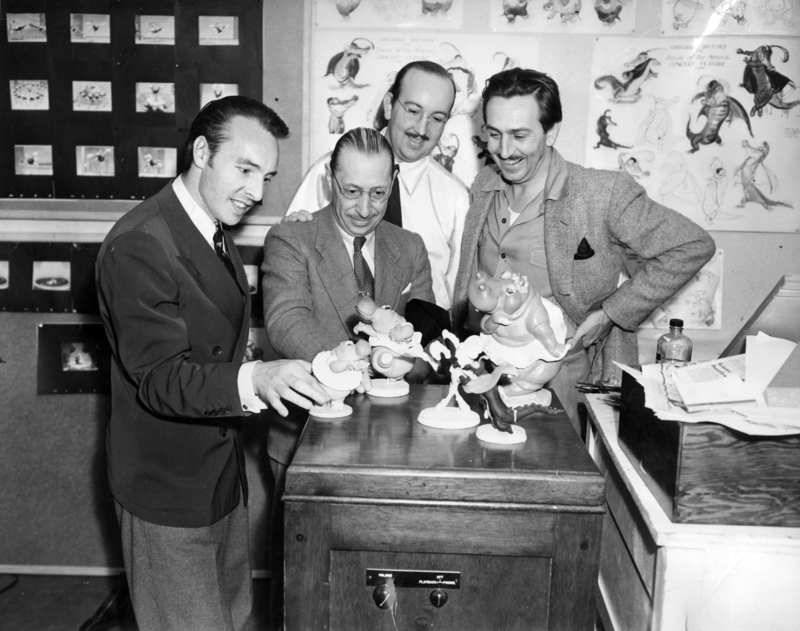 Walt Disney (far right) looks on as his FANTASIA collaborators (from left) George Balanchine, Igor Stravinsky and T. Hee peruse a model for the film. Photo courtesy Los Angeles Public Library. But there was trouble brewing in paradise. Labor unrest and union organizing threatened to derail Walt’s career trajectory and his new studio in Burbank. Part Two (1941-1966) chronicles the arc of betrayal and mistrust that apparently transformed Walt from Mr. Nice Guy into a grudge-carrying, “friendly witness” during the HUAC hearings in 1947. To escape the turmoil, Walt focused his attention and “better angels” instead on a seemingly frivolous personal pursuit: building and commandeering his own scale-model railroad. And, of course, that child friendly railroad eventually compelled him to design and build a “community” around it. It would be called Disneyland. Part Two is a breathtaking and often touching look at how Walt delved into new film genres (nature films, live-action comedies and live-action/animation hybrids) and markets to keep his brand fresh and financially viable. He even managed to secure a deal with ABC-TV to fund the building of Disneyland. That back story is riveting, as is the film footage that records and tracks the evolution of Disneyland from landfill to monumental opening day. Walt Disney, a lifelong chain-smoker, died tragically from lung cancer at age 65 with plans underway for yet another new dream “community,” this time in Florida, to be called EPCOT. 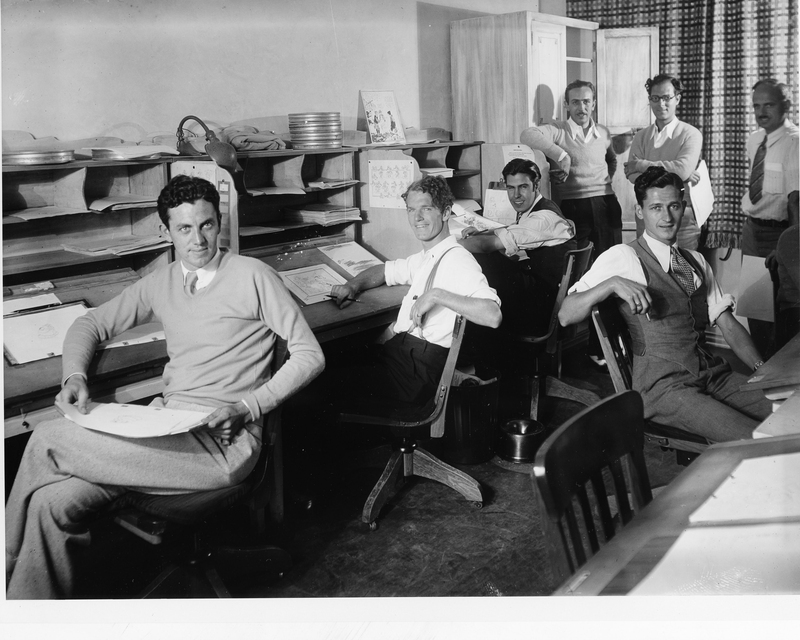 Walt Disney (standing far left) and some of his animators, circa 1931. Photo courtesy David Lesjak. The glorious film clips, vintage behind-the-scenes footage, home movies and recollections from various old-timers who knew and worked with Walt as animators; designers; ink and painters; and composers; including his son-in-law, producer Ron Miller, provide welcome insight into Walt’s psyche, creative endeavors and executive temperament. However, the pompous rhetoric posited by the film’s resident cultural “scholars” often stops the film dead in its tracks. If you’re a Baby Boomer, the timeline and psychology behind Walt Disney’s impact on your life is quite simple. You remember exactly how Disney films and TV shows and the promise of visiting Disneyland fit into your life. You remember where you were when you first were frightened by the Evil Queen in Snow White, cried during Bambi, held your breath when the clock struck 12 in Cinderella or danced down the street after watching Mary Poppins. You remember how excited you were to buy Davy Crockett coonskin caps or how you never missed an episode of The Mickey Mouse Club. You remember how good all of those moments made you feel and why. 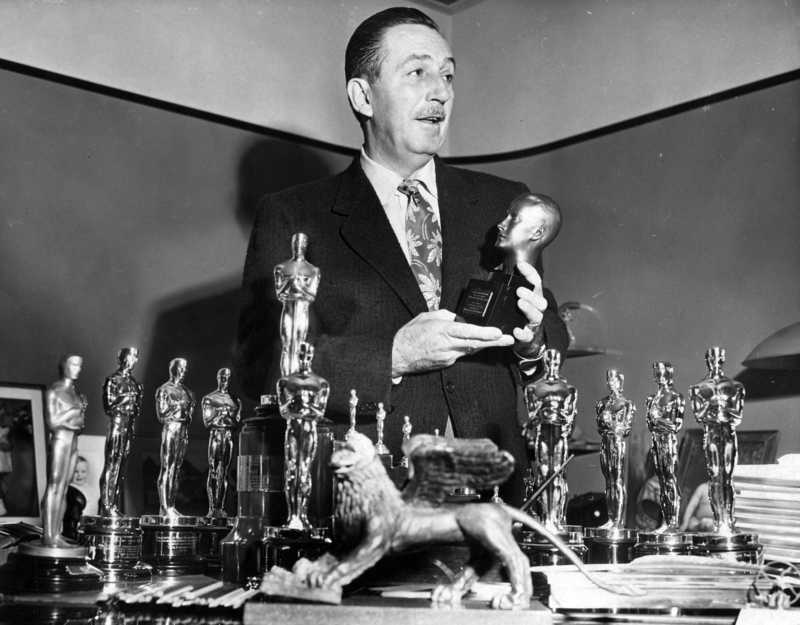 Walt Disney holds the record for the most Academy Award nominations and wins. Photo courtesy Los Angeles Public Library. And so, like me, you’ll probably want the “experts” who drain the energy out of the documentary with their windy psycho-babble–about Walt’s feelings at any given moment, his so-called demons and the cultural context of our Baby Boom generation–to just put a sock in it. Call me Grumpy, but one of these particularly self-important blowhards–a young, female cultural historian with insignificant film history creds–should have landed more often than not on the cutting-room floor. This entry was posted in Art, Film, TV and tagged American Experience, Animation, Bambi, Cinderella, Disneyland, Fantasia, Mary Poppins, Mickey Mouse, Pinocchio, Roy Disney, Sarah Colt, Snow White and the Seven Dwarfs, Steamboat Willie, Walt Disney. Bookmark the permalink. It just occurred to me that Leonard Maltin’s not in this. I wonder why. He’s as much of an expert on Disney as any of the rest of the featured interviewees. One of the first film books I ever purchased was his book, “The Disney Films,” published sometime in the early 1970s. And he’s got the seal of approval of the Disney Corporation, given his involvement in so many Disney DVD releases. Also, yesterday I went to Strand Books to look for Gabler’s and Barrier’s books (not there), but I did find “The Magic Kingdom: Walt Disney and the American Way of Life,” by Steven Watts, who’s also featured prominently in the film. It looks like the result of some pretty thorough research, so I look forward to reading it. of them must be close to 100 by now. of books on Disney, like Neal Gabler, Richard Schickel and Mike Barrier. I wish they’d used snippets of interviews from FRANK AND OLLLIE and other docu’s that have been made over the decades. Better than the nonentity talking heads. The only bio of Disney I’ve yet read is Schickel’s The Disney Version, which I highly recommend. I watched SAVING MR. BANKS today. Fascinating film. I’m not entirely sure how to process it, though. It’s very manipulative. How much of it is accurate? It seems to be another piece of the Disney mythmaking apparatus. What if it had been made by another studio by a filmmaker who sought to craft a critique of Disney? I wonder if they talk about it in Part 2. Thanks for your input, Brian! As I was watching both segments of WALT DISNEY, I kept thinking Ken Burns would have been the best one to tell this story on film. Aside from the obvious reasons, he would not have included the insignificant talking heads (I agree that Gabler, Schickel and Barrier were relevant, but maybe a little less Gabler). What drove me nuts in the end was utilizing these “scholars,” especially those with no real film creds, as “the voice” of Disney. When they started telling me what Disney was thinking and feeling at any given moment, the film just came to a screeching halt for me. Ken would have incorporated letters,diary entries, etc., and other ephemera from Disney himself or family members or colleagues to tell his story. And when or if they weren’t available for a particularly personal or career event, Ken would not fall victim to the lazy use of insignificant scholars, who, as you mention, probably got their knowledge from reading a book about Disney. I think American Experience took a gamble with this massive topic and gave viewers a decent timeline and backstage pass to Walt Disney’s life and times. The clips and walk down memory lane are wonderful. Better than reading a book about Disney? Calling Ken Burns!! !– Judy, the Hopeful!